Professional mobile cell phone repairing service centers and professional individuals need a good quality soldering iron or soldering station for proper mobile phone repairing. There are several manufacturers, exporters and suppliers of soldering irons and soldering stations. A soldering iron is a simple plug and use tool for soldering solder wire and electronic components to the PCB. These soldering irons are available in different wattage such as 15 watt, 20 watt, 25 watt, 30 watt, 40 watt, 50 watt etc. A 30 watt soldering iron is good enough for most soldering jobs. Some of the soldering irons have in-built knobs for temperature control setting. Temperature of the tip of the soldering iron can be adjusted from 250 degree Celsius to 450 degree Celsius. When buying Soldering iron for mobile phone repairing, it is wise to buy an ESD-Safe soldering iron because it prevents static charge that can damage sensitive electronic components on the mobile phone PCB. A soldering station is a system of two units – a station with all the controls to adjust temperature and a soldering iron. 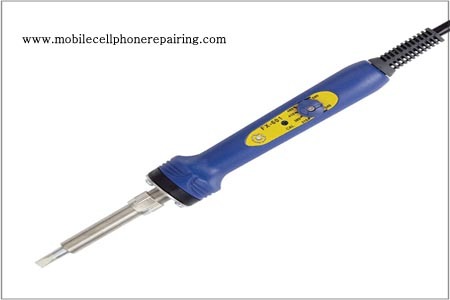 The soldering iron is different from simple plug and use soldering iron. These irons can only be used with a soldering station. These systems are available in both analog and digital models and ESD-Safe and non ESD-Safe. 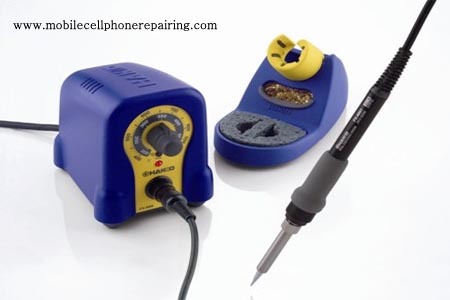 It is always recommended to buy an ESD-Safe soldering station for professional mobile phone repairing job. There are a number of manufacturers and suppliers of soldering irons and soldering stations. But the market leaders are Hakko and Weller. These two brands are widely known all around the world. There state-of-art tools and equipment are tried and tested by engineers, electronic companies and professionals. So what is the best tip size for mobile repairing soldering? What you you usually use? Thanks to your information .Please can you hep me how to buy those tools and equipments online ? They are available on eBay.